Are you ready to turn all your files over to "the cloud?" 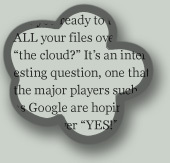 This interesting question is one that the major players such as Google are hoping you will answer "YES!" to. Anyone who has used the extensive services Google offers online, such as Google docs* can see a future where you may not need all the 'general' apps on your local hard drive, as long as you're willing to move your production online and rely on a service to ensure your creations will be there when you need them. Oh, goody- 24/7 access to work… OTOH, as our lives and businesses become more global, the ability to collaborate across miles and time zones will be essential, so access wherever we are at the moment may just save our sanity in the end. *Google docs allows you to create word processing documents, presentations (slides), spreadsheets, forms and drawings in a browser window and then either keep them private, email them, or publish them as web pages. They are fantastic for anytime you are away from your home computer or just don't want another program open, which I've often used them for. The current obstacles to widespread use are privacy concerns, reliability and connectivity. Privacy comes down to whether you trust Google not to get hacked, I guess. As for reliability, keep in mind that even the mighty Google isn't immune to server failure— my advice is the same I gave my kids when they went off to college: email your most important documents to yourself at another account, so they are duplicated and accessible online. As for connectivity, we all know that is hit or miss in some locations, especially if you are relying on wi-fi for your web connection. If you're a business person on the go, you probably already have a mobile hotpsot or 3G card that keeps you online, in which case it would be rare that access would be a problem. Pixels or resolution- why is this so confusing? Actually, it's the same thing, but you need a little math to convert one to another. DPI, as I've discussed before, has to do with with how many dots, or pixels, there are in one inch of your image. 72 dpi is screen resolution— what your monitor can display. Printed pieces can accommodate many more pixels per inch than electronic displays. One mega pixel refers to a size of one million pixels. A one mega pixel image that is 1000 x 1000 pixels @ 300 dpi is 3.33” x 3.33”- which is an 3.8mb document (in CMYK for printing, 2.86mb in RGB for screen). That same image resized to 250 dpi is 4” x 4” and at 72 dpi (screen resolution) it is 13.88” x 13.88”- all 3.8mb documents. So if your camera is advertised at 4 megapixels, that means that if it is set for it's highest resolution, it will give you 4 million pixels— and 8” x 8” print at 250 dpi- which is an 15.3 mb document (in CMYK for printing, 11.4mb in RGB for screen). This is good to keep in mind when buying storage cards; I prefer to shoot at the highest resolution and then reduce the document size on Photoshop, so I buy huge cards so as not to run out of space. If you get a great shot, you don’t want to find out it’s the size of a postage stamp and can’t be blown up enough to make it into your client’s poster or trade show banner. But you should also know that if you’re shooting your child’s weekend game, that even the $10,000 printer at the local photo shop can’t utilize all the pixels in a 12 megapixel image. Digital watermarks may also be invisible, identifying the owner of the material but not distorting the image. This method is often used to tag video to identify illegally copied movies. An article from the Sunday’s New York Times Fine Print Blurs Who’s in Control of Online Photos revisits the social media sharing vs. privacy debate. Creative materials, in this case photos, are copyrighted when they are produced, so what gives the World Entertainment News Network the right to SELL your photos? Or “to pursue legal action against those who use such images commercially without its permission”? Do you transfer your rights when you post a photo to an online site? In reality, I imagine few people actually read any “Terms Of Service” before agreeing to them. Pages of legal jargon makes most folks eyes glaze over, and the idea that anyone would even want to sell the photo you posted of Aunt Ethel taken at your cousin’s wedding seems ludicrous. But for professional photographers, especially when the primary subject of their work is celebrities, this is a very real threat to their livelihood. Since you are agreeing to the “Terms Of Service” make sure you read them first. Esp. the part where they reserve the right to change the TOS without notice. If this subject interests you, you may also want to read Carolyn E. Wright’s blog about legal issues relating to photography; Ms. Wright is both a full-time attorney and a professional photographer. Years ago, in the early days of website design, a friend and I trekked into Manhattan to attend a Verizon event. Verizon’s marketing geniuses- some of whom must have stayed up very late concocting this idea- had devised a program whereby they would refer clients to designers (who paid Verizon a percentage for the referral) in return for a kickback, I mean percentage, when the client signed on to host their site on Verizon’s servers. You can guess who came out on the winning end of that deal. That wasn’t the kicker though. Imagine a room filled with designers…99% of whom worked on Macs at that time. After this long presentation, it came out that to upload the web files you would have to use Front Page, which at that time was strictly a windows based software package. I raised my hand. “Isn’t Front Page only made for PCs?” "Yes," was the reply. “But at the rates you guys are getting for web design, you can all afford to go out and buy a PC for uploading to our servers.” I swear to you this is what he said. At that point, the other 99% of attendees joined me in getting up to leave, over the desperate cries of the presenter promising us all nifty mouse pads if only we signed up. This blog post- and a bad taste in my mouth- was all I got out of that day's adventures. Sorry for the delay in getting this post out. I’ve been working on a project, and clients must come before blogging! Remember when you didn't know what you know now? I have, naturally, been talking to friends and colleagues about topics for this blog. One suggestion was to discuss what challenges I have faced being a small business owner myself. This led to the topic of how hard it is to unlearn what you already know. I amassed a lot specific knowledge of this business, but it's hard to go back and remember what I didn't know when I started out, and I bet it's the same for you. When clients are planning their websites, I advise them to think like a user, but it's much easier to impart what you know than to think as if you didn't have that knowledge. Think of how they found your site— what did they search for? Did they even do a search, or did they find a link and follow it? Who do you expect your users to be? If you sell widgets, you can likely narrow down your audience and have a good idea of what they hope to learn at your site. If you can think back one more step, you can discover what sites your buyers may have come from. Aside from a search engine, they may have been on an industry or trade show journal site, or maybe a social networking site. This shows you where to look for links/referring pages. If you use a particular material to make your widgets, maybe the manufacturer of that material would like a reciprocal link. Or perhaps both you and your buyers are members of the same industry association- be sure you have a listing there that includes your website address as well as your contact info. Associations that cater to your target buyers will benefit you more than associations that include your competition. If you sell services, look for general business sites, publications and groups. If your services are used by more than one industry, you can configure several sites, each catering to one of them. This will incur additional costs, so start with one main site first and add others later. You can have different referring links point to different pages within your site, too. If you sell blue widgets and red ones, refer blue widget buyers to the blue page and red widget buyers to the red widget page. Remember, links to your site boost your search engine results, and other website owners are looking for links for the same reason. When I started to write a post about keywords and meta tags, I got sidetracked into checking the sitemaps for my clients’ websites. Google has a whole gaggle of tools. (I apologize for that- it’s cheesy, I know.) One of these is webmaster tools. Once you set up your account, after making sure all your code is in order, you submit your site to the great search god. In addition to keywords and meta tags, google likes sitemaps. A sitemap is a page/file of plain code (xml) that lists the pages included in you site and the frequency that they are updated. I downloaded a new Dreamweaver® extension, generated a new sitemap for my own site (I prefer to be my own guinea pig and never take chances with clients’ sites) and discovered that google wasn’t accepting it. This led me to the site: http://www.xml-sitemaps.com which generates sitemaps for free. This wasn’t foolproof either, but I soon discovered the problem. 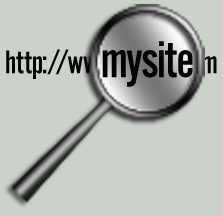 If you submit a site to google as “http://mycompany.com”, then all the pages in your sitemap must be in the form: “http://mycompany.com/pageone.html”. If you submit a site to google as “http://www.mycompany.com”, then all the pages in your sitemap must be in the form: “http://www.mycompany.com/pageone.html”. If you’re like me, and just start typing a company name into the url & letting the browser fill it in for you, you might never notice which sites come up as "www" and which do not. You used to need the "www", but that’s no longer the case, and while “http://mycompany.com” and “http://www.mycompany.com” are exactly the same page, google is really just a collection of computers, and they are sticklers for details. Computers are sticklers for details because they can’t read written language- they read binary code. EVERY SINGLE CHARACTER you type is translated into binary, therefore while you may view a ‘space’ as nothing, a computer sees it as “00100000”. You can test this out by googling “convert to binary” and visiting one of the free sites that allow you to input text and get binary code back. That’s how I got this background- it says “website wisdom” and “inside design”! To close out the week, I want to address a question I’ve received a few times in the past couple of weeks- Why am I doing this? Here’s how I look at it: these topics are all information I've been explaining to new clients for years. It may seem foolish to give it away, but it's nothing that isn't already available online if you know what to search for. I know it can be intimidating to embark on a project that's totally out of your area of expertise- I remember taking a beginner's course in auto mechanics just so I could understand what they were trying to say. I like to be informed about what I’m buying. I am hoping to gain exposure and inspire confidence that I know what I'm talking about and can handle whatever project a potential client might need. This is just a glossary- I don't plan to teach readers how to code html. The people who will use this information as a "do it yourself" guide aren't likely to hire a professional anyway. Do this: move your cursor to the ‘View’ menu of your browser and choose "view source"— if you can read that, you don't need me! Labels: why am I doing this? There's an infamous story that in the early days of the internet, a company placed the name of their biggest competitor over and over again in their website keywords so that when anyone searched for the competitor, their site would show up instead. I don't know if this is true (the story goes on to say that they were successfully sued for doing this) but it goes to illustrate that firms have been trying to get to the top of the search list since there was a search list. Like businesses who called themselves AAA Company, Inc. to appear first in the yellow pages, companies would do whatever they could think of to get a leg up on the competition. There are many significant practices that will improve your search results, but while the SEO firms may disagree with me, there are no magic tricks to ensure success. Good page titles, concise copy, and good keywords & site descriptions placed in the header code all go into making your site successful. Arranging reciprocal links back/forth to your site also helps; linking to professional groups and associations are best for that, or sites such as LinkedIn. Facebook is great if your product or service is geared towards individuals who might spend time there– I know two photographers who have had great success with FB– but my clients aren’t likely to be found there, at least not yet. Common sense will tell you it's not in google's best interest to be cracked; build your site with best practices and you will find success. Search sites spend lots of money on hiring the best minds to make certain they return helpful and accurate results, not skewed in anyone's favor. Every time someone comes up with a ‘sure fire’ way to raise their site rankings, google changes the algorithm. Every time. A little note about what computers can- and cannot - do. The ad game has been around for a very long time- as long as sales, I would reason. When a new client came into an agency, they would be assigned an AE- an Advertising Executive. The AE wasn't the designer, but would have a designer on their team, and the team would meet to brainstorm ideas around the client's needs to develop an approach for their campaign. This was all done by discussions & meetings with paper and pencils. You would meet with a client, sketch pad in hand and come up with ideas as starting points. It is very hard to convey graphic ideas with only words. You may think you are on exactly the same page only to find out later that they were thinking of something completely different. The thing is, this sometimes worked on your favor. You could be working on an idea/sketch you believed the client agreed with, when a remark made you realize they were picturing something different. But since you were in preliminary sketches, a few adjustments would take you back in their direction. The work process has changed tremendously over the past 20+ years, but the process of designing has evolved more than changed— it all still stems from the mind of the designer and the collaboration of designer & client. This may seem obvious, but in terms of marketing, if you have your own domain, all your email should be sent from you@yourcompany.com. Your domain package will come with at least one email address, usually several, and you can set up your computer's email program to check and send email from your domain. Another option is to have your email address solely as an alias, and use a web service for your email. We use gmail, because it has a great spam filter, but also because you can send email from your domain name, not just your gmail.com account. You can set up one for “info@yourcompany.com" another for sales@yourcompany.com, and one for any employees or colleagues that you have. They might all end up in the same place, but only you (and your web host) will know that. Most email programs can handle attachments up to 5mb, and some allow larger attachments, but remember that an email can get transferred more than once on its journey and if it encounters any server with a size limit, it will get bounced back. For attachments moving within a given company (and so never going out to the web) attachment size should not be a problem. For larger attachments that are traveling across the web, you have a couple of choices. You can work with your provider to set up a folder on your site with password access where you can store larger files for client download, or you can use one of the websites established for just this purpose, like yousendit.com. There are only a few file formats that can be attached to an email as is- jpgs, gifs, pdfs and Microsoft docs will go through the web unscathed. Other files must be compressed- “stuffed" or “zipped". (http://www.stuffit.com) And be aware that just because you CAN open a file, doesn’t mean you SHOULD. Web-based email programs scan for viruses, but one way or another, make sure the attachment is scanned for viruses before you open it! It may look like it came from a relative or trusted friend, but it doesn't mean they intentionally sent it- their computer may have a virus! If you want/need an e-commerce site, you must have a way to get paid. If you already accept credit cards, you could simply put a sales form on your site where clients can input their info, BUT without a secure certificate, the transaction will not be encrypted and your customers' data is at a risk. A savvy buyer will look for the “https" in the URL or a lock icon to assure the site is secure. You can purchase your own secure certificate - prices and features vary widely - or use your ISP's. If you buy your own, your URL will not change (other than the http changing to https) but if you use your ISPs, your URL for the form will change to: http://(myisp.com)/yourcompany. Not every customer will even notice the difference, and you can always place an explanatory statement at the top of your page, so you have to weigh your options and decide which is best suited to your needs at the time. Another option is to use PayPal for business. You will choose an option that is appropriate for your particular business, and can adjust it later as your business grows.